Last month, legendary Jewish baseball coach Skip Bertman was honored at Louisiana State University. But while the retired Bertman led LSU to five national championships, it is a different Jewish coach from the Southeastern Conference who is leading his team into the College World Series finals this week. Mississippi State (51-18) begins its first-ever CWS finals appearance Monday, facing off against UCLA in a best-of-three series for the national championship. It would be the first national championship for Mississippi State in any team sport, and the first consensus national championship for the state of Mississippi (Ole Miss shared the 1960 football crown with Minnesota). Coaching the team is John Cohen, who grew up just down the road in Tuscaloosa, home of the Alabama Crimson Tide, where he wanted to play quarterback. 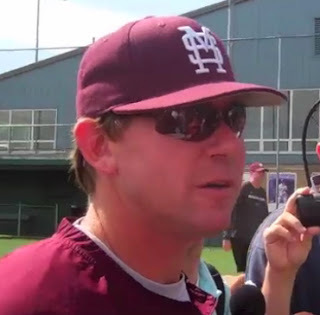 Instead, his baseball prowess landed him in Starkville as a player, and in June 2008, 18 years to the day after playing his final game for the Bulldogs — at the College World Series, no less — he returned to “Our State” as coach. Now he is back in the Series, as coach, having succeeded his coach, the legendary Ron Polk. Cohen graduated from Tuscaloosa Academy in 1985 and played baseball for a year at Birmingham-Southern College, but decided he wanted to play for a major Division I program. His father Harry, who died the year before Cohen returned to Mississippi State as coach, was a professor at the University of Alabama School of Law for 38 years. In 1992, he started his coaching career at the University of Missouri as hitting instructor and recruiting coordinator. While there, he also earned a master's in sports administration. His success there led to his first head coaching position, at Northwestern State in Natchitoches, La. He led the Demons to two Southland Conference titles and an overall 146-84 record. In 1998 and 2001, the championship seasons, he was named Southland Conference Coach of the Year. While there, he led a fundraising campaign to boost the baseball park’s seating from 298 to 1,000 — but over 4,000 showed up when they played and defeated defending national champion LSU in 2001. In 2002, the Florida Gators came calling, making him hitting coach. The Gators soon led the conference in numerous offensive categories. Kentucky then called him away to be their head coach and he took the program to its first-ever Southeastern Conference championship, in 2006. He was also named SEC and national coach of the year for the “worst to first” rebuilding. When he and his family moved to Starkville, Cohen was reunited with another Jewish Mississippi State legend, the now-retired Jack Cristil, who was the radio voice of Mississippi State football and basketball for 58 years. It also put them closer to family. He and wife Nelle met in Tuscaloosa in their early teens, and they have two children, Jordan and Avery. His sister, Nettie Blume, was in her and her husband’s law office in Tuscaloosa when the April 2011 tornado leveled the building. They emerged without major injuries. His mother, Doris Cohen, also still lives in Tuscaloosa. Cohen’s hiring was controversial. Polk had wanted his assistant, who was a teammate of Cohen’s, to get the job and threatened to work against the program when that did not happen. After a rough first couple of years in Starkville, Cohen had brought in enough players that fit with his style of coaching, and in 2011 made it to the super-regional in the NCAA baseball tournament, losing to Florida. Last year, Mississippi State again made it into the tournament after winning the SEC tournament. Four of the top six years all-time in season ticket sales have been during Cohen’s tenure at Mississippi State, and he instituted a program where players hand-deliver many of the tickets to fans in the Starkville area. To reach the College World Series in Omaha, the Bulldogs had to go on the road and win the super-regional at Virginia. To reach the finals, Mississippi State beat Oregon State twice. Oregon State won the Pac-12 championship, defeating UCLA twice in three games. UCLA, though, has gone 8-0 in the NCAA tournament with a 1.00 ERA. Outfielder Hunter Renfroe leads the team, batting .360 with 15 home runs and 61 RBIs, and was selected 13th overall in the baseball draft earlier this month. Doris Cohen told him that she really wanted Renfroe to get his 16th home run in Omaha. Though he cautioned her that TD Ameritrade Park was a huge field, it happened, in a big way. Renfroe’s three-run shot in the fifth inning was the decisive factor in the 4-1 victory over Oregon State to reach the finals on June 21. One prominent story line has been the proliferation of beards among the players, after pitcher Trevor Fitts did a Powerpoint presentation on sports winners who have beards. Before that, Cohen had banned facial hair for his entire coaching career, but relented and has encouraged a relaxed atmosphere of fun around the team. This has led to speculation that Cohen might join in with a beard if they win. “Not a good look for me,” he tweeted from Omaha. “Our kids just think something good is going to happen and, by the way, our coaches do, too,” Cohen said. First pitch will be at 7 p.m. (Central) Monday and Tuesday, and Wednesday if necessary. The games will be carried on ESPN. “It’ll be a fun series,” Cohen said.